Very impressive speech by Gov. Strickland. Keilar reports there are also several Kennedys in the VIP box: Vicki Kennedy, Ted Kennedy, Jr., and Rep. Patrick Kennedy. And members of Congress: Rep. Jim Clyburn, Rep. Xavier Becerra, Rep. Charles Gonzales. @Kman and saved millions of jobs! If he didn't, people would complain about how he lost more jobs. Republicans...nothing will ever be good enough for you. Let Romney win, see how much better off you will be. 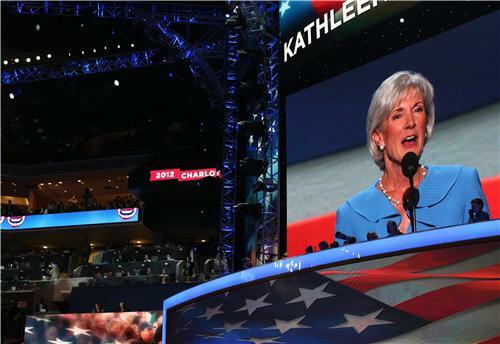 Sebelius addressing delegates at Democratic convention says what's missing from the Romney/Ryan Medicare plan is Medicare, "Romney and Ryan would put insurance companies back in control." Obama's former chief of staff, Chicago Mayor Rahm Emanuel, is also there, as well as several union heads: Randi Weingarten of the American Federation of Teachers, Dennis Van Roekel of the National Education Association, AFL-CIO president Rich Trumka, SEIU president Mary Kay Henry, and Bob King, president of the United Auto Workers, Keilar reports. Thank you CNN for this blog and up to the second updates. Rahm Emanuel is speaking now - he was recently in the news...talking Chick-fil-A. MA Gov. Deval Patrick should be interesting, exposing the mess his administration inherited from Romney... Tonight, the reasons Mitt never talks specifics of his term as govenor in MA will become a WHOLE lot clearer! TRIVIA: Kamala Harris, who was just interviewed live on CNN, is a co-chair of Obama's campaign. Who was the co-chair of Obama's 2008 campaign that spoke last week at the RNC? TRIVIA: Name both of Rahm Emanuel's brothers, and their occupations. The President's brother-in-law spoke to Piers Morgan earlier this year about lessons learned from playing basketball against the President. The view from the CNN convention coverage control room in Washington, D.C., as captured by CNN Producer Eric Weisbrod. 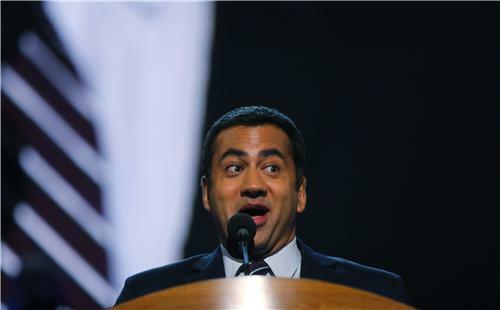 Actor/Producer Kal Penn addressed the Democratic National Convention, urging young people to register to vote and joking that he wonders what hash tag will be trending on Twitter following his speech.. suggests #sexyface. Playing now: "Stronger Together Video: Equal Pay"
The next hour - three big speeches: Gov. O'Malley of Maryland, Mayor Julian Castro and First Lady Michelle Obama. Watch it all live on CNN. 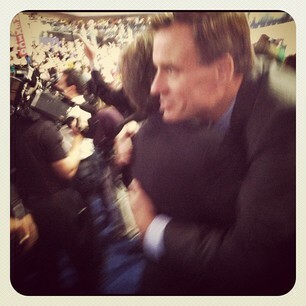 Text from RNC delegate: "I'm officially jealous. The DNC looks way more exciting"
That was an awesome speech by the Gov. of Mass. Gov. Martin O'Malley speaking now. Earlier this week, his comments about whether America was better off than 4 years ago gained some attention when he said the answer was "no" - then later changed his answer. (Anyone know the trivia answer)? O'Malley's audience participation line: "Forward, not back." 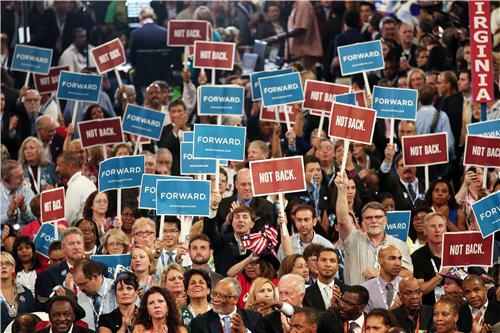 Obama campaign slogan: "Forward." "Mitt Romney and Paul Ryan now say they want to take America back," he asks. "And so we ask: Back to what?" This is the most exciting (and hairraising!) Convention I have seen in50 years....I voted for Obama in 2008 and I will vote for him again ----He is a truly Great and Gutsy Man!! TRIVIA: Gov. Martin O'Malley about to speak live (watch it on CNN). He was Mayor of Baltimore, and now is Governor of Maryland. Which fictional character on a TV show also had that political career? 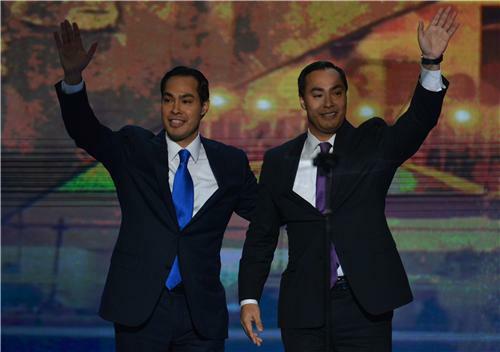 Another recent CNN appearance by Julian Castro - from Erin Burnett OutFront. Christie's speech is in the rear view mirror. Castro has been impressive. And now, a video tribute to First Lady Obama - followed by her speech. The final speech of the night. That was a great speech by Castro.